A former girlfriend of Rep. Keith Ellison (D., Minn.), who has accused him of domestic violence, on Wednesday released what she says is a medical document from 2017 in which a doctor writes about alleged abuse suffered at the hands of the congressman. Karen Monahan, a Democrat, posted the document on Twitter after saying this week that she has been "smeared" by her party since she made her story public in August. "She [Monahan] states that she was in a very stressful environment for years, emotional and physical abuse by a partner with whom she is now separated," the doctor wrote. "She identifies the individual she was involved with as congressman Ellison, and she is worried about retribution if she identifies him publicly," the document continues. The document includes a Nov. 28, 2017 date and proves, according to Monahan, that she spoke with medical professionals about abuse she suffered and named her attacker before her story became public. Monahan has also said she has a video of Ellison attacking her and dragging her off a bed, though she said it is traumatic and won't release it. Ellison is not seeking re-election for his congressional seat in order to run for Minnesota attorney general. He won the Democratic primary days after Monahan's allegations in August. Monahan says the Democratic Party, of which Ellison is the deputy chair, has "smeared, threatened, and isolated" her. "Four people, including my supervisor at the time, stated that I came to them after and shared the exact story I shared publicly," Monahan said. "I shared multiple texts between me and Keith, where I discuss the abuse with him and much more. As I said before, I knew I wouldn't be believed." She made the comments on Twitter this week in response to a question about how Democrats have treated her in comparison to Supreme Court nominee Brett Kavanaugh’s accuser, Christine Blasey Ford. Monahan said she has faced threats and isolation from members of her own party, despite her evidence against Ellison. Ford came forward in the past week with an allegation Kavanaugh tried to sexually assault her at a party when they were both in high school in the early 1980s. Democrats have called for Ford to be heard and the delay of a vote on Kavanaugh's confirmation. Kavanaugh and others Ford alleges were at the party have denied the allegations. 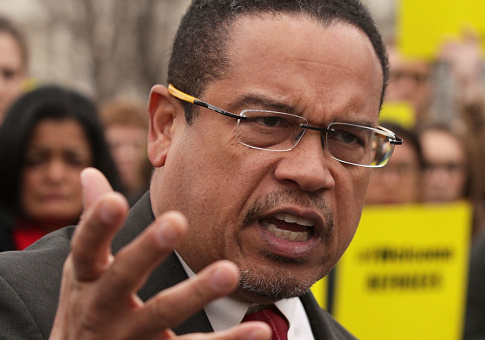 Monahan claims Ellison abused her as recently as 2016. She has defended her decision to come forward with her claims, which she did after her son posted about an alleged incident on Facebook, and says she is not trying to score political points. "I have nothing to prove to anyone, I simply shared my story. People can believe it or not. I don’t need anyone to affirm my humanity, I affirmed it," she said. Monahan said on Twitter she agreed to sit down with investigators to discuss Ellison's abuse, but he declined a meeting with her. It is currently unclear whether Ford will appear before the Senate Judiciary Committee on Monday to testify about her allegations against Kavanaugh, a hearing many senators from both sides of the aisle have requested. Senate Judiciary Committee Chairman Chuck Grassley (R., Iowa) has urged Ford's lawyers to respond to a request to testify, but after initial pushes for such a hearing to occur, Ford's lawyer has said she wants an FBI investigation to be conducted first. Kavanaugh has agreed to testify. This entry was posted in Politics and tagged Keith Ellison. Bookmark the permalink.